Up a small path on a steep hillside at St Dogmaels, near Cardigan, Pembrokshire, Rachel Shiamh has built a beautiful straw bale house. The bales are structural, meaning that they are not just infill to a timber frame: they actually carry the weight of floors and roof. 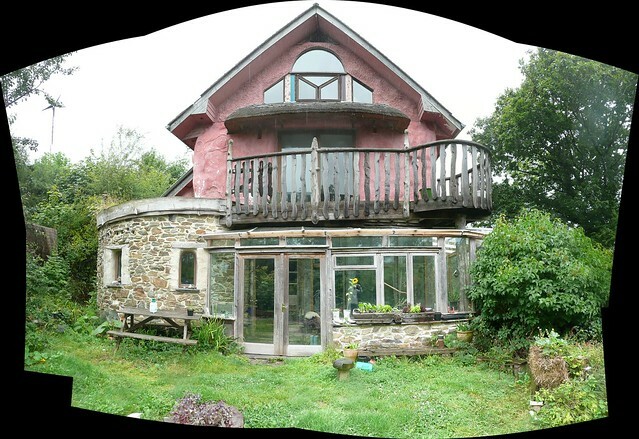 There is a video tour round the house on the PermaculturePermaculture is the practice of a sustainable way of living in all its forms. In the UK the coordinating body is the Permaculture Association web site. It won a the Grand Designs Eco Home of the year award. I love your house, i would like to buy land and build low impact house . Ive seen Tony Wrench house too. Can you recommend anyone who could build me a wooden house if i can find suitable land . Does it cost much ? I live in Aberaeron in Ceredigion. But have always dreamt of building my own low impact house and livin a simple life . Do you have any advise ?